About 65 million years ago, a massive disruption led to worldwide extinction of dinosaurs. The impact of a giant asteroid created massive tsunamis and spewed forth a global cloud of carbon gases that altered Earth's atmosphere and blocked the light for weeks, possibly years. 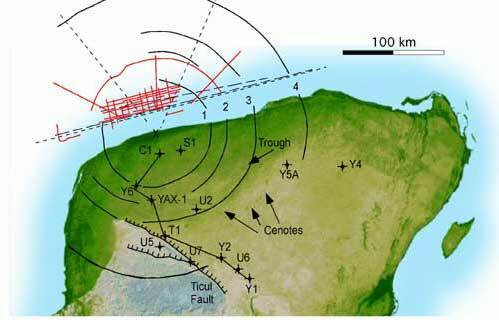 In recent years, that impact event has been linked to a 112-mile-wide crater, dubbed Chicxulub, on the coast of Mexico's Yucatan Peninsula. Since its discovery in the 1980s, the Chicxulub crater has left its own impact on sky-watchers and sci-fi fans worldwide, and impact events have been depicted in Hollywood films such as "Armageddon" and "Deep Impact," as well as countless artistic renditions. Despite the spotlight on the theories surrounding the impact, Michael Whalen, associate professor of geology at University of Alaska Fairbanks, has managed to stay "out of the limelight, yet into the limestone" with his work sampling the core of the crater. Due to the efforts of Dr. Buck Sharpton, UAF Vice Chancellor for Research, Whalen became part of an international effort to correlate seismic data with information obtained from a drill hole that reaches more than 1.2 miles deep, through the impact layer and beyond. Interestingly enough, unlike other more noticeable craters, the Chicxulub crater spent 55 million years in virtual obscurity, due to the fast infilling that masked its presence. Speedy recovery, which by geologists' standards amounts to about 10 million years, preserved the crater by mantling it with sediment, attracting geologists like Whalen, who studies the effects of extinction events on carbonate layers (also known as limestone) and the organisms that make up those layers. On Jan. 20th, Whalen will be traveling with a team to the Chicxulub site for a week to obtain more core samples in order to get a better understanding of how the crater filled in and how the earth itself recovered from the massive impact. He's also part of an ongoing collaboration that is trying to secure funding to drill two more holes in the crater, one off shore and one through the peak ring.